Aftermarket dispenser locks are the most effective security system against credit card skimmers. The ROI in gained security can end up saving your business. Needless to say, the cost:value ratio is extraordinary. Here is a question to consider: Would you leave your car unlocked in a public parking lot? For most, this is a no brainer. Hopefully, by the end of this blog post, you’ll be thinking the same way about your dispensers. Would you leave your gas dispensers unlocked in your forecourt? In essence, this is what fuel marketers are doing when they do not install aftermarket locks. Fuel dispensers handle large amounts of sensitive customer information which is what makes them prime suspects for credit card skimmers. One of the primary reasons why skimming devices get installed on dispensers is that fuel dispensers come equipped with universal OEM locks. This means that access keys for gas dispensers are readily available, making them easy targets for data theives. 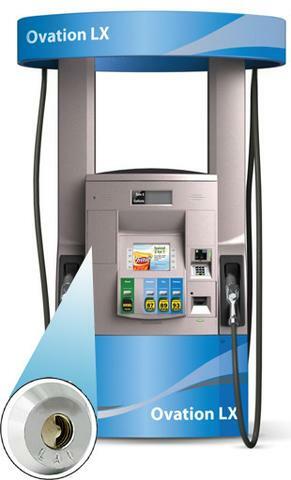 To clarify, ALL factory equipped fuel dispensers come installed with universal OEM locks. This is how the dirty work takes place. Once a thief gains access to the inside of your dispensers then they will have no problem installing their skimming devices. They install blue tooth skimmers, video cameras and in recent cases cellular transmitters so that they never have to visit the site again. This is why securing your fuel dispensers is the most important line of defense against deterring credit card skimmers. By upgrading the factory locks to aftermarket locks you will block the majority of would be skimmers. This is because they will arrive to your site, recognize their factory key doesn’t work, decide they don’t want to waste their time and move on to their next victim. Skimmers diverted, customer info secured, business saved. As a certified CompX distributor, Shields, Harper is committed to making your station secure. This simple investment is the most effective investment you can make to secure your business and ensure your customer data doesn’t get compromised. Each of our branches are stocked with inventory for all types of dispensers.